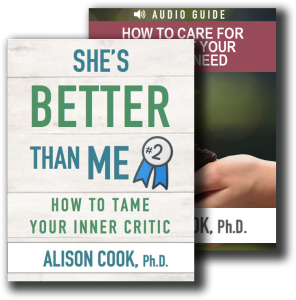 How to Identify a Part of Your Soul in Need - Alison Cook, Ph.D. If you’re struggling with an extreme emotion, a hurting part of your soul might need your attention. Typically, an extreme emotion, such as anger or anxiety, or an overwhelming compulsion, such as over-thinking or people-pleasing, is a cue that some other more vulnerable part of your soul needs your attention. Let’s say you’re feeling irritable, for example. You notice that everything around you—from the sales clerk at the store to the person driving next to you in traffic to your spouse’s well-intended “Hey, what’s for dinner? !” lands on a prickly part of your soul. You don’t want to feel that way, but some part of you has taken over and you just can’t shake your feelings of anger and frustration. Such emotional hijackings happen to all of us. Maybe you can’t shake your anger, or your striving task manager won’t let you rest. Maybe you can’t stop saying “yes, sure thing!” when what you really want to say is, “no, thank you.” These types of feelings and reactions come from protective parts of your soul. They’re well intended. But when extreme, such protective activities keep you from accessing your vulnerabilities hiding deep within. When you notice an extreme emotion, or an activity you can’t stop, take a moment to focus on it. Get curious about it. “I wonder why I can’t stop working, even though I’m exhausted?” “It’s so hard for me to say a simple ‘no’. I wonder what I’m afraid might happen if I did.” “I’m aware of how irritable I am today. I wonder what else might be going on with me.” Try not to judge or criticize yourself. Extend compassion toward whatever it is you notice. As you connect to this part of your soul with compassion, you’ll likely notice other emotions start to surface: fear, guilt, loneliness, or sadness, to name a few. These are the more vulnerable parts of your soul, the parts of you that can feel overwhelming or uncomfortable. If I can just keep working harder, I won’t have to feel that loneliness deep inside. I can’t say “no” to that person; I’ll lose their love. If I stop feeling angry, I’ll sink into depression. You’re beginning to notice the patterns in your emotional make-up. Observations like these show how your protective instincts work to keep you from facing uncomfortable and vulnerable feelings. The good news is that with the help of God’s loving Spirit, you can face your loneliness, your fear, and even your sorrow. You can then learn how to provide those emotions with the real help they need. You can heal. And you can find your way out of being dominated by out-dated, unproductive patterns of thinking and feeling. Emotions aren’t inherently good or bad. When they become extreme, they’re simply a signal to pay attention to your soul. And as you tend to both your protectors and the more vulnerable feelings hiding at the corners of your soul, you’ll heal your painful emotions. And you’ll create a more balanced, harmonious internal life.